Rebels has been on a bit of a break for the past month or so, but I’d actually fallen behind on these Rebels Screenshot Spotlight posts a few weeks before the show’s brief hiatus started. With a new episode set to premiere in just a few days, I thought I’d better take the opportunity to weigh in on my favorite shots from the episodes I’d missed. First up is “The Future of the Force.” The most compelling image in Rebels season two’s tenth episode features the show’s new villains the Seventh Sister and the Fifth Brother attacking the passengers of a dimly lit shuttle. The “Red Blades” (as the passengers refer to them) show up in the episode’s first scene to abduct a force-sensitive baby for unclear, but clearly nefarious, reasons. The shot I’ve pulled from this scene is comprised of the grandmother of baby Alora in the foreground with her back to the camera attempting to both sooth and protect her granddaughter. She’s looking down a corridor populated by a few fearful passengers but her gaze, like theirs, is on the approaching Inquisitors exiting an airlock bathed in red light. The camera is tilted at a Dutch angle which contributes to the sense of dread and tension permeating the shuttle. This scene is one of a number this season featuring these new Inquisitors that focuses on fear and borrows from the language of horror films to clearly communicate that these villains are dangerous, evil, and worthy of taking up the Grand Inquisitor’s role as the show’s chief antagonist(s). Writing, design, voice actors, and music are of course all part of successfully presenting these imposing characters, but I’ve found this kind of horror film framing to be an excellent contribution to their development as well. I’m looking forward to posting in the next few days about a beautiful and moving moment in “Legacy,” one of my favorite episodes this season, and then getting back on schedule when Rebels returns with “A Princess on Lothal” on January 20th. Categories: Rebels Screenshot Spotlight | Tags: Dave Filoni, Fifth Brother, Inquisitors, McQuarrie, Ralph McQuarrie, Rebels, Seventh Sister, Star Wars Rebels | Permalink. “Stealth Strike” stands out as an episode of Rebels that features a plethora of visual call-backs to the original trilogy (not unusual for the show, but at an even higher volume here), but also at least one key and noticeable reference to the The Phantom Menace. Actually, I’m sure there are many smaller examples of artistic influence from the prequels throughout Rebels; though the concept art generated by Ralph McQuarrie for the original trilogy is clearly the visual foundation of the show, Dave Filoni and crew are no doubt drawing inspiration from George Lucas’s more recent vision of the Star Wars universe in more subtle ways as well. This shot of Ezra sabotaging the reactor core of The Interdictor seems to be an example of that kind of approach. While the room and structures are most noticeably similar to the scene in A New Hope in which Obi-Wan shuts down the Death Star’s tractor beam, the design also draws on the Theed generator complex from The Phantom Menace. The verticality of that structure led to an incredibly dynamic scene, and the Rebels crew takes full advantage of that aspect of this reactor core room in “Stealth Strike,” with Ezra moving up and down between platforms as he reflects blaster bolts back at the Imperial troops above. In one of the best episodes of the season so far, this reactor core scene is able to pay tribute to both the original trilogy and prequel trilogy eras while creating an exciting new sequence of its own. Categories: Rebels, Rebels Screenshot Spotlight | Tags: Ezra, Ezra Bridger, McQuarrie, Ralph McQuarrie, Rebels, Star Wars Rebels | Permalink. 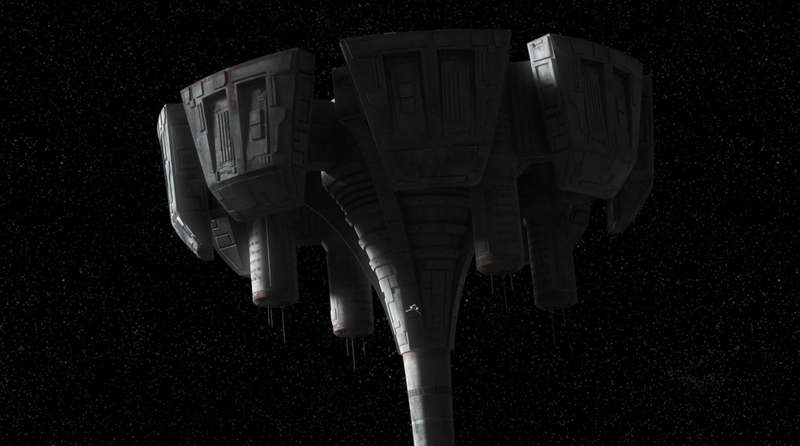 It occurred to me while watching the most recent episode of Rebels, “Always Two There Are,” that I’d like to do something here on The Blockade Runner blog to show appreciation for the incredible art/design/look of the show. To be honest, I wasn’t sure about the show’s style when the characters were revealed (there had been a bit of talk re: the McQuarrie influence and I think was expecting something different), but from the moment I was able to see it in motion, I’ve been incredibly impressed. Seeing Joel Aaron’s presentation at Celebration Anaheim only increased my appreciation for the show’s look and dedication to authenticity, and the initial shot of The Ghost approaching the abandoned Republic medical station moved me to action. I was initially taken aback by the presentation of the medical station itself; the elegance of the station and the cylindrical or almost funnel-like shape of it seemed distinctly McQuarrie. I think it may have reminded me of some of his Cloud City designs, and upon doing some digging I found a piece of Coruscant concept work that shares some similarities with this design. I’m not sure if this specific station was directly influenced by McQuarrie concepts or not, but it shares qualities with his designs that I think are very beautiful and very Star Wars. I was also struck by the enormity of the medical station in relationship to The Ghost. It becomes clear as the episode unfolds that Ezra and the rest of the crew are pitted against a powerful enemy that outmatches them in most ways, and the composition of this shot emphasizes that the deck is very much stacked against them and that they’ll have to overcome a major challenge to successfully complete their mission. I’m no design expert, so I hope it’s clear here that I’m commenting on this shot from “Always Two There Are” out of appreciation for the incredible work of the Rebels crew. Watching Rebels has delighted me more than I expected in numerous ways, and its so gratifying and exciting to be presented with such beautiful imagery each week, so I’m looking forward to finding more breathtaking shots to feature from upcoming episodes. Categories: Rebels, Rebels Screenshot Spotlight | Tags: Always Two There Are, Art, Celebration, Celebration Anaheim, Coruscant, Design, Ezra, Joel Aaron, McQuarrie, Ralph McQuarrie, Rebels, Rebels Screenshot Highlight, Star Wars, Star Wars Celebration, Star Wars Rebels, The Ghost | Permalink.